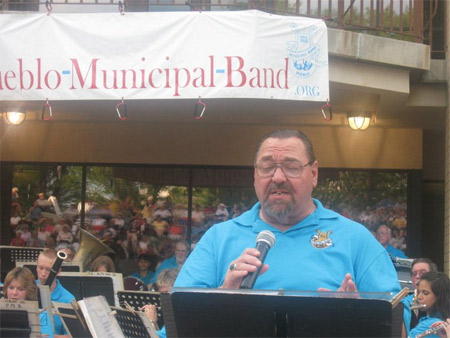 Brent Ritter belts out a tune during the Pueblo Municipal Band summer concert series. The music library of the Pueblo Municipal Band presently consists of over 1100 professional arrangements that we have performed, representing over 17 different categories of musical styles. Examples would include: musicals, overtures, spirituals, latin, novelty, showtunes, ensemble features, classical, jazz, marches, patriotic, pop, big band, solos, waltzes, and movie themes. It is estimated that an equal number of arrangements have yet to be heard for the first time. Many of the Band's arrangements are permanently out of print. And, the band is deeply grateful to all the previous conductors and librarians for their effort to preserve, maintain, and protect this irreplaceable music and legacy for the last ninety years.